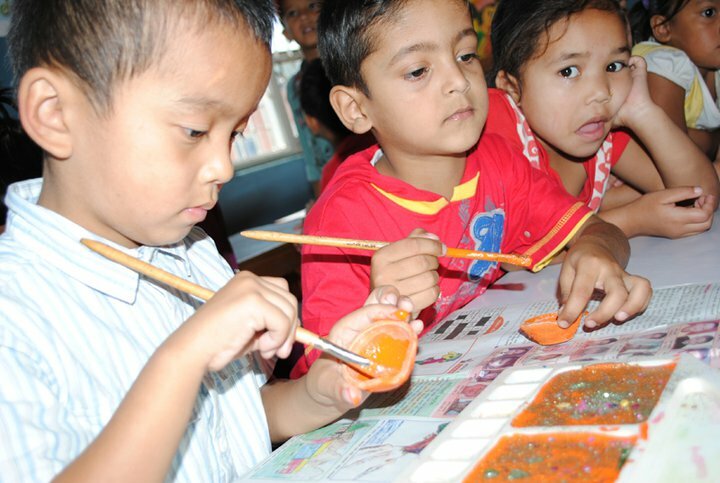 The school opens admission for grade Nursery every year in Baisakh (late April). Admission might be open for other classes too depending on the number of students already enrolled. More details will be announced, when admission opens, through local and national media, the school’s website and Facebook page. Admission for grade 11 (for both science and management streams) begins right after the School Leaving Certificate (SLC) results are published (generally around mid-June). More details will be announced, when admission opens, through local and national media, the school’s website and Facebook page. 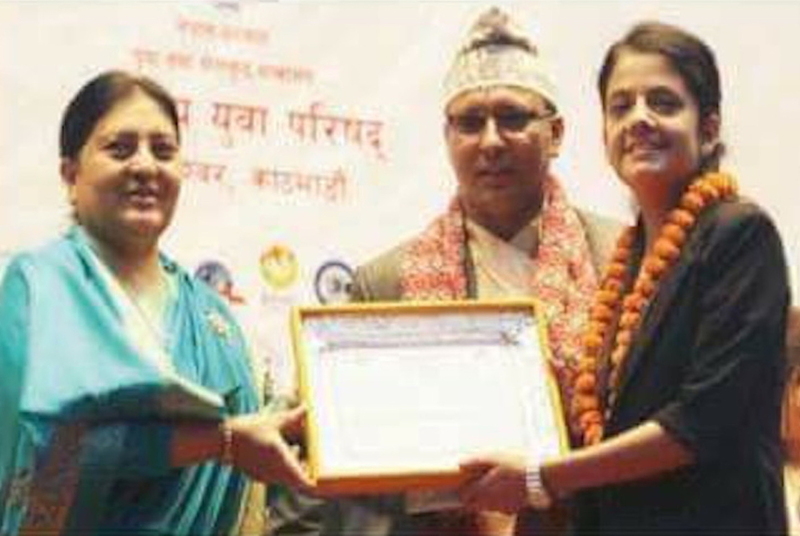 Global Collegiate School was established in the year 1995 at Ramghat, Pokhara, Nepal, and got its approval from District Education Office, Kaski in the same year. We shifted to Ranipauwa, Pokhara and started higher secondary level education (10+2) in the year 2006. So the name and address of this school had been changed to be Global Collegiate Higher Secondary School, Ranipauwa, Pokhara. In the beginning of 2017, Nepal government passed new education bill and directed all higher secondary schools to rename as Secondary Schools. Finally, our school has been registered as Global Collegiate School, Ranipauwa, Pokhara, Nepal under the new education act 2017 in Department of Education, Education Ministry of Nepal. Secondary Education Examination SEE 2074 result has been published. We Global family would like to congratulate all our students for their outstanding result in SEE 2074. 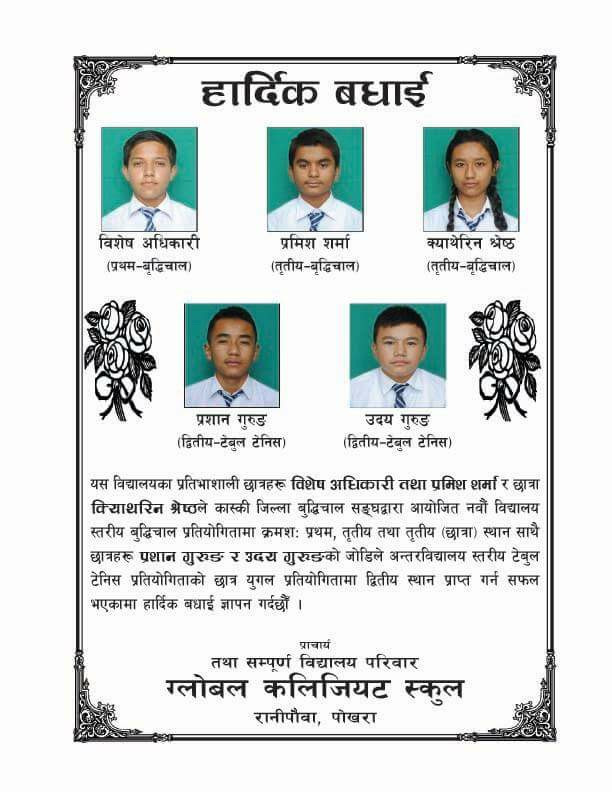 We wish all for their bright future. Grand Exhibition was held at global premises. Student from different class exhibits their material according to their class. Click below to see full gallery. 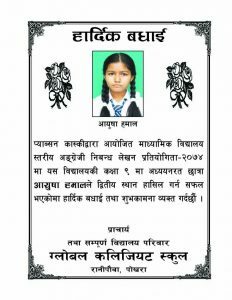 Ayusha Hamal from Class 9 of this school stood second on Inter school English Essay Writing Competition organized by PABSON kaski. We Global family would like to congratulate Ayusha for her success. 12th Western Regional Mathematics Quiz – 2074 was held here in Global Collegiate premises. 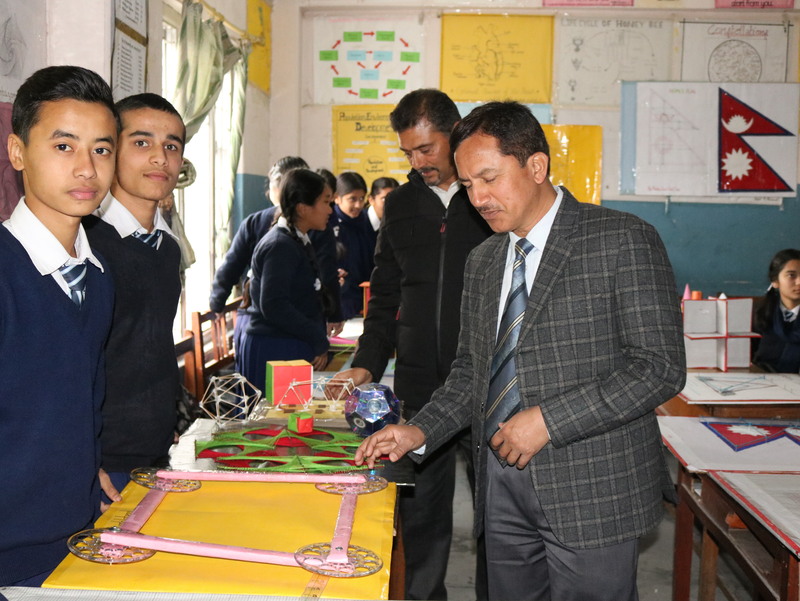 The event was organized by Council for Mathematics Education Kaski in 16th and 17th of Bhadra. Altogether 109 teams from more then 50 schools took part in very competition. The event was conducted in two shift. Written round of 1 hour was conducted in first shift, from which 18 teams was selected for the next shift. Quiz was conducted in second shift among 18 teams. 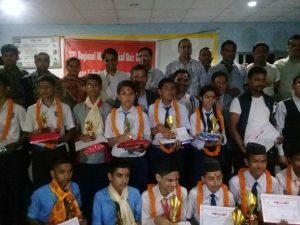 Globalian dominant in inter school chess competition. Our students Bisesh Adhikari, Pramish Sharma and Katheryn Shrestha wins first, third and third (Girls) respectively in inter school chess competition organized by Kaski district chess association. 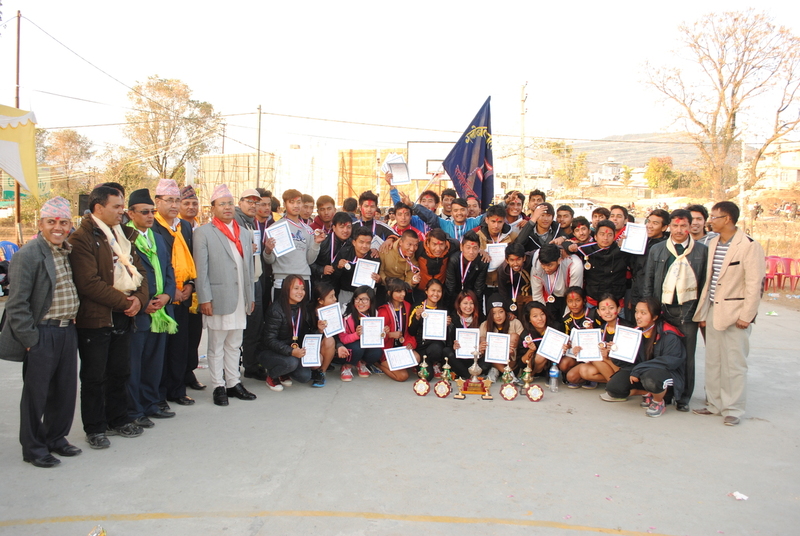 Similarly, pair of Udaya Gurung and Prashan Gurung stood second in double table tennis competition.